PRAGUE, September 17, 2006 (RFE/RL) -- A summit of the Non-Aligned Movement (NAM) has ended in the Cuban capital, Havana, with Iran winning solid support in its nuclear row with the West. The document also opposes terrorism and urges reform of the United Nations to give poor countries' greater power. Perhaps most topically, the 92-page final declaration adopted unanimously by leaders from 118 states supports Iran's right to develop nuclear energy for peaceful purposes. Cuban Foreign Minister Felipe Perez Roque said the members of the NAM "reject any monopoly over nuclear technology" and the idea that "those who have nuclear weapons [can] prohibit others from using nuclear energy for peaceful means to produce electricity, for medical use, [and for] other peaceful purposes." The declaration urged Iran to cooperate fully with the UN nuclear watchdog, the International Atomic Energy Agency (IAEA), but noted that the IAEA found that all nuclear material declared by Iran had been accounted for. Iran's President Mahmud Ahmadinejad questioned the independence of the United Nations, complaining that "the superpowers of the world, including the United States, are using the Security Council as a basis for using strong-arm tactics to impose policy." UN Secretary-General Kofi Annan agreed that the council must be more responsive to less powerful countries. The theme of U.S. influence over international affairs was a recurrent theme at the summit, and the closing statement contains many veiled criticisms of the United States. The president of the presidium of North Korea's Supreme People's Assembly, Kim Yong Nam, defended its nuclear weapons program arguing that the United States left it no option but to seek a deterrent. He said that there is therefore "no justification whatsoever to urge the Democratic People's Republic of Korea [DPRK] to return to the talks unconditionally. The DPRK will never go back to the talks while under U.S. sanctions." Acting Cuban President Raul Castro and Venezuela's President Hugo Chavez delivered harsh condemnations of U.S. policies. Others, though, insisted that the NAM is not "anti any country." Founded in 1961, the NAM aimed to act as a counterweight to Western states and the Soviet bloc when most nations were being pressured to take sides in the Cold War. The NAM declaration broadly condemned terrorism, with exceptions for movements for self-determination and battles against foreign occupiers. It also condemned what it terms Israel's "unlawful" policies in the Palestinian territories and its recent military intervention in Lebanon. Cuban President Fidel Castro, who underwent emergency surgery more than a month ago, was too unwell to attend the gathering but was nonetheless named president of the movement for the next three years. The summit also provided an opportunity for some to push for improved bilateral relations. Pakistani President Pervez Musharraf and Indian Prime Minister Manmohan Singh agreed to resume negotiations to bring peace to the disputed region of Kashmir and to battle terrorism together. Musharraf said "a historic opportunity exists that must be seized by the leadership of the two countries to bring to a close a chapter of tension and conflict in our region." Bilateral discussions continued after the summit, with two of its most prominent participants, Iran's President Ahmadinejad and Venezuela's President Chavez, meeting in Caracas. Among 20 commercial agreements to be signed during the meeting are plans to set up a joint petrochemical company; to produce bricks, cement, bicycles, and cars; and for Iran to help train Venezuelan metallurgical workers. Chavez and Ahmadinejad have already agreed to explore for oil and natural gas in Venezuela, and the two presidents are due on September 18 to visit an oil field for a ceremony marking the start of joint drilling. Venezuela and Iran have agreed to set up a $200 million investment fund and Iran has agreed to build 10,000 homes in Venezuela. The two countries' efforts to forge closer ties reflect their frosty relations with Washington. 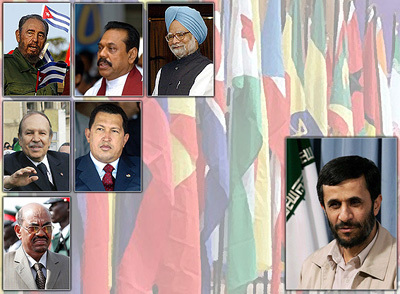 Chavez has defended Iran's nuclear program, a point he again underlined at the NAM summit.